© 2013, Reginald Brooks. All rights reserved. All particles are composites of quarks. Quarks, following the classification scheme first laid out in L.U.F.E. (1985), come in two forms: I-quarks and L-quarks. 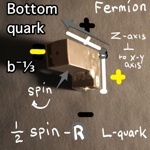 Both can form either bosons or fermions. Helpful I and L Quark Reference Charts and select images from L.U.F.E. and The LUFE Matrix follow the gallery. The Spinor Rotation page is here.